SEATTLE (AP) — “Grande ego. 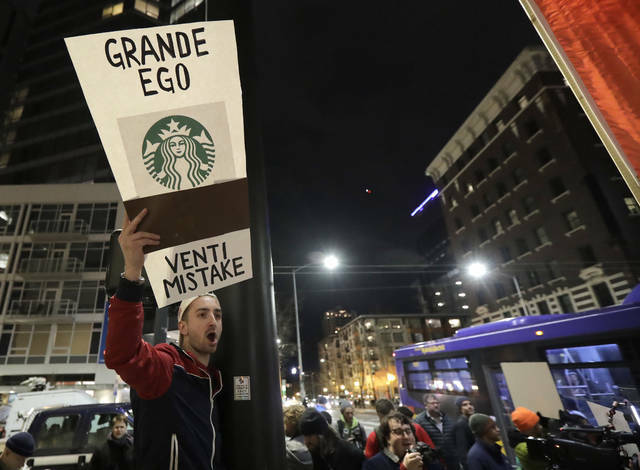 Venti mistake”: That was the message protesters had for former Starbucks CEO Howard Schultz as he returned to his hometown of Seattle on Thursday after announcing that he’s mulling an independent run for president. Several dozen protesters gathered outside a downtown theater before Schultz appeared to promote his new book. They included Democrats who fret his candidacy would hand President Donald Trump another term, and green-and-gold-bedecked basketball fans who haven’t forgiven him for selling the Seattle SuperSonics to a group that moved the team to Oklahoma City more than a decade ago. Inside, though, he got a warmer reception, with hearty applause from a crowd of 1,100, especially when he apologized about the Sonics and described the health insurance and stock options he offered to Starbucks employees early on. He said he doesn’t intend to decide whether to run for president for several months, but the reaction from prominent Democrats has been swift. Washington Gov. Jay Inslee, the party chairwoman in Washington state, top advisers to former President Barack Obama and the most powerful political action committee in Democratic politics are among those who have criticized him, saying an independent bid would likely split the opposition to Trump and make his re-election more likely. The protesters outside his talk Thursday chanted: “Pick a party.” Some carried signs decorated like Starbucks cups that read “Compost your campaign” and “Grande ego. Venti mistake” — a reference to the Italian names for drink sizes at the coffee chain. In Seattle, where 92 percent of voters cast ballots against Trump in 2016, helping get him re-elected might be even less popular than selling off a beloved sports franchise. 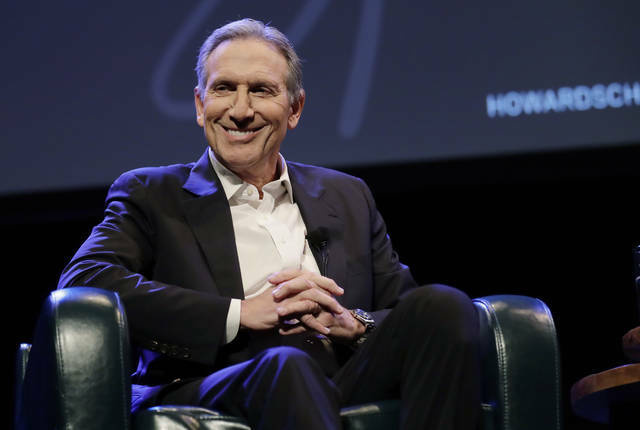 Many in the audience applauded a heckler’s suggestion he run as a Democrat, and several also cheered ideas that Schultz was panning, such as drastically increased tax rates on the super-rich. The crowd was more muted when Schultz explained away his voting record — he’s cast a ballot in just 11 of 38 state, federal and local elections since 2005, as The Seattle Times first reported. He said he has voted in every presidential election since he turned 18, but otherwise said he simply hasn’t been engaged in local politics. Chris Petzold, a Democratic activist from the Seattle suburb of Issaquah, organized the protest Thursday. She said she remains sad about the Sonics departure, but the protest wasn’t about that. Schultz has repeatedly said he doesn’t want to be responsible for Trump’s re-election, but that he believes there is a way to unite a significant portion of the public that identifies with neither major party. In an opinion piece published Wednesday in The Seattle Times, Schultz acknowledged that he has a “complicated” relationship with Seattle, a city he first fell in love with during a visit to Pike Place Market in 1981. It’s the city where he grew a small coffee-roasting company into an inescapable global chain, where he and his wife raised their two children, and where the couple still lives. Along the way he made Starbucks one of the first U.S. companies to offer stock options and health insurance even to part-time employees; more recently, it partnered with Arizona State University to cover tuition for workers who want to earn their bachelor’s degrees online. In 2001, Schultz led a group of investors in buying the Sonics and the WNBA’s Seattle Storm for $200 million. Due partly to an unfavorable lease deal and the small size of KeyArena, where the team played, the Sonics were losing millions of dollars a year. After being rebuffed by the Legislature in his efforts to win public funding to remodel the venue, Schultz sold the team for $350 million to the group that moved it to Oklahoma City and renamed it the Thunder. The Sonics were Seattle’s oldest professional sports franchise and the first Seattle team to win a national title since the Seattle Metropolitans won hockey’s Stanley Cup in 1917. Some Sonics fans considered the apology long overdue — not to mention suspect, given that it coincided with the announcement of his presidential musings. Schultz’s politics aren’t necessarily going to win him many fans in his liberal hometown, either. Seattle was one of the first U.S. cities to approve a $15-an-hour minimum wage; Schultz opposed it, fearing it would cost jobs. The law remains popular, and economists say it has raised pay without any real impact on employment. 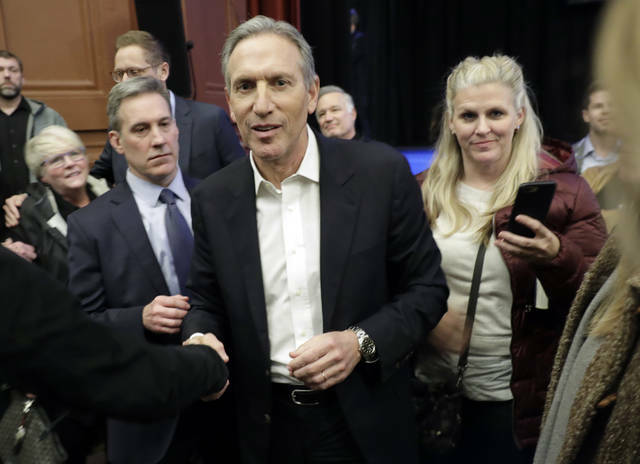 Schultz’s consideration of a presidential run even drew a rebuke from a fellow Seattle billionaire, early Amazon investor and outspoken liberal Nick Hanauer. “What Howard calls ‘centrism’ is just trickle-down economics_tax cuts for the rich, de-regulation for the powerful, and wage suppression for everyone else,” Hanauer tweeted. Does climate change activist Michael Bloomberg practice what he preaches as a potential presidential candidate? That was the question that Carly, a political-science major from New England College, asked the former NYC mayor during a New Hampshire appearance on Tuesday promoting his new book on climate change—and possibly a 2020 POTUS bid. Bloomberg had a witty comeback — “First let me say that I’m addicted to Cheez-Its and popcorn”– but he left Carly’s question unanswered. Like many progressives who see the political as the personal, the Gen-Z college student wanted to know if Bloomberg walks his climate change talk? And the answer appears to be no. In fact, the man who was appointed the U.N. secretary-general’s Special Envoy for Cities and Climate Change in 2014 doesn’t so much “walk” his #GreenNewDeal lifestyle as “fly” it. “What’s happening to the world is really scary,” Bloomberg said in his speech at the New Hampshire Institute of Politics on Tuesday, “and it may be irreversible. I hope not. “You just have to take action, and that’s what we’re trying to do. And we’re trying to get people starting from the bottom up. What we need is a president that can lead us instead of trying to drag us backwards,” Bloomberg said. “From the bottom up,” perhaps. But from the top down? Bloomberg, a licensed pilot, owns a $30 million Dassault Falcon which he flies a couple of times every month to his waterfront home in Bermuda. When he’s not in his jet, Bloomberg can be found piloting his $4.5 million Agusta SPA A109s helicopter. A flight in a private jet generates an estimated 37 times more carbon emissions than the same trip on a commercial flight. And Bloomberg’s six-seat chopper burns a jaw-dropping 72 gallons of fuel every hour. When Bloomberg does drive, he’s got a high-performance Audi R8 sports car (from 0-60 in less than 4 seconds) and a comfortable Chevy Suburban SUV. Neither vehicle gets more than 15 mpg in city driving. And when the public complained about the environmental damage being done by his SUV idling on the street with the air conditioning on, Bloomberg’s solution was to have his staff wheel an actual window-unit air conditioner out to his car on hot, summer days. Not exactly the actions of a man who believes “climate change is a crisis,” as Bloomberg told NBC’s Chuck Todd. And about that multi-million-dollar mansion in Bermuda. It’s one of at least 10 properties Bloomberg owns around the world, and even by luxury island resort standards, it’s impressive: Seven bathrooms, five balconies, 6,000 square feet and all of it right on the water. Bloomberg’s day-to-day home is a five-story townhouse on Manhattan’s Upper East Side with an estimated 12,500 square feet of space. Then there’s his mansion in the Hamptons, Ballyshear, with 22,000 square feet. Based on published accounts of his various holdings from London to Vail, CO, climate champion Michael Bloomberg owns more than 100,000 square feet of housing he must heat and cool on a regular basis. As for Michael Bloomberg going “vegan,” the conflict between his pro-health-food, soda-tax-and-snack-food-ban politics and his personal dietary habits is well-known. “My favorite vegetable is steak,” then-Mayor Bloomberg quipped in 2010, at the same time he was pushing healthy eating with TV chef Rachel Ray. “I like most vegetables,” he said, “but I love steak.” At Rustico, one of his favorite haunts in Bermuda, he’s known for ordering up platters of herb-marinated chicken and beef tenderloin. Bloomberg’s even a member of the exclusive Game Creek Club in Vail, CO which, in between appetizers of foie gras and Wagyu carpaccio, serves bison, venison and wild boar. On Tuesday, Bloomberg acknowledged that he wasn’t anywhere near going vegan, listing a litany of animal proteins he still packs away, from fish to fast-food burgers. In fact, just hours after his appearance, Bloomberg was spotted in in Nashua, NH with a slice of pepperoni pizza, loaded with cheese. But does that matter? Will Democrats who support Bloomberg’s climate-change policies reject him in the 2020 primary because of his personal behavior? Will environmentally-mined voters like Carly put a candidate’s lifestyle choices ahead of his climate-action agenda? If they do, Michael Bloomberg can read all about it while relaxing in his seven-bedroom, Eighteenth-century London estate. Michael Graham is political editor of InsideSources and NH Journal. He’s also a CBS News contributor. You can reach him at michael@insidesources.com. Disclosure statement: Alexander Koch receives funding from the Natural Environment Research Council Doctoral Training Partnership initiative. Chris Brierley receives funding from the Natural Environment Research Council, the Belmont Forum and the national Science Foundation (US) to study climates of the past and future. Mark Maslin is a Founding Director of Rezatec Ltd, Director of The London NERC Doctoral Training Partnership and a member of Cheltenham Science Festival Advisory Committee. He is an unpaid member of the Sopra-Steria CSR Board. He has received grant funding in the past from the NERC, EPSRC, ESRC, Royal Society, DIFD, DECC, FCO, Innovate UK, Carbon Trust, UK Space Agency, European Space Agency, Wellcome Trust, Leverhulme Trust and British Council. He has received research funding in the past from The Lancet, Laithwaites, Seventh Generation, Channel 4, JLT Re, WWF, Hermes, CAFOD and Royal Institute of Chartered Surveyors. Simon Lewis has received funding from Natural Environment Research Council, the Royal Society, the European Union, the Leverhulme Trust, the Centre for International Forestry, National Parks Agency of Gabon, Microsoft Research, the Gordon and Betty Moore Foundation, the David and Lucile Packard Foundation. Partners: University College London provides funding as a founding partner of The Conversation UK. While Europe was in the early days of the Renaissance, there were empires in the Americas sustaining more than 60m people. But the first European contact in 1492 brought diseases to the Americas which devastated the native population and the resultant collapse of farming in the Americas was so significant that it may have even cooled the global climate. The number of people living in North, Central and South America when Columbus arrived is a question that researchers have been trying to answer for decades. Unlike in Europe and China, no records on the size of indigenous societies in the Americas before 1492 are preserved. To reconstruct population numbers, researchers rely on the first accounts from European eyewitnesses and, in records from after colonial rule was established, tribute payments known as “encomiendas”. This taxation system was only established after European epidemics had ravaged the Americas, so it tells us nothing about the size of pre-colonial populations. Early accounts by European colonists are likely to have overestimated settlement sizes and population to advertise the riches of their newly discovered lands to their feudal sponsors in Europe. But by rejecting these claims and focusing on colonial records instead, extremely low population estimates were published in the early 20th century which counted the population after disease had ravaged it. On the other hand, liberal assumptions on, for example, the proportion of the indigenous population that was required to pay tributes or the rates at which people had died led to extraordinarily high estimates. Our new study clarifies the size of pre-Columbian populations and their impact on their environment. By combining all published estimates from populations throughout the Americas, we find a probable indigenous population of 60m in 1492. For comparison, Europe’s population at the time was 70-88m spread over less than half the area. The large pre-Columbian population sustained itself through farming – there is extensive archaeological evidence for slash-and-burn agriculture, terraced fields, large earthen mounds and home gardens. By knowing how much agricultural land is required to sustain one person, population numbers can be translated from the area known to be under human land use. We found that 62m hectares of land, or about 10% of the landmass of the Americas, had been farmed or under another human use when Columbus arrived. For comparison, in Europe 23% and in China 20% of land had been used by humans at the time. This changed in the decades after Europeans first set foot on the island of Hispaniola in 1497 – now Haiti and the Dominican Republic – and the mainland in 1517. Europeans brought measles, smallpox, influenza and the bubonic plague across the Atlantic, with devastating consequences for the indigenous populations. Our new data-driven best estimate is a death toll of 56m by the beginning of the 1600s – 90% of the pre-Columbian indigenous population and around 10% of the global population at the time. This makes the “Great Dying” the largest human mortality event in proportion to the global population, putting it second in absolute terms only to World War II, in which 80m people died – 3% of the world’s population at the time. A figure of 90% mortality in post-contact America is extraordinary and exceeds similar epidemics, including the Black Death in Europe – which resulted in a 30% population loss in Europe. One explanation is that multiple waves of epidemics hit indigenous immune systems that had evolved in isolation from Eurasian and African populations for 13,000 years. Native Americas at that time had never been in contact with the pathogens the colonists brought, creating so-called “virgin soil” epidemics. People who didn’t die from smallpox, died from the following wave of influenza. Those who survived that succumbed to measles. Warfare, famine and colonial atrocities did the rest in the Great Dying. This human tragedy meant that there was simply not enough workers left to manage the fields and forests. Without human intervention, previously managed landscapes returned to their natural states, thereby absorbing carbon from the atmosphere. The extent of this regrowth of the natural habitat was so vast that it removed enough CO₂ to cool the planet. The lower temperatures prompted feedbacks in the carbon cycle which eliminated even more CO₂ from the atmosphere – such as less CO₂ being released from the soil. This explains the drop in CO₂ at 1610 seen in Antarctic ice cores, solving an enigma of why the whole planet cooled briefly in the 1600s. During this period, severe winters and cold summers caused famines and rebellions from Europe to Japan. The modern world began with a catastrophe of near-unimaginable proportions. Yet it is the first time the Americas were linked to the rest of the world, marking the beginning of a new era. We now know more about the scale of pre-European American populations and the Great Dying that erased so many of them. Human actions at that time caused a drop in atmospheric CO₂ that cooled the planet long before human civilisation was concerned with the idea of climate change. Such a dramatic event would not contribute much to easing the rate of modern global warming, however. The unprecedented reforestation event in the Americas led to a reduction of 5 parts per million CO₂ from the atmosphere – only about three years’ worth of fossil fuel emissions today. The European Union’s (EU) new General Data Protection Regulation (GDPR) was sold as critical motion to implement data privacyprotections for consumers. People are justifiably concerned about protecting their data in an age when it serves as a currency. And, as technology comes to permeate ever more aspects of our lives, those concerns will become more pressing. Unfortunately, the GDPR is ill-suited to protect people’s privacy and threatens to drown technological innovation in a morass of bureaucracy. In fact, new data shows that the GDPR is helping strengthen the very tech platforms it was supposedly designed to reign in. This should not surprise anyone, especially on the heels of a decade of GDPR-like regulations. American lawmakers should study these outcomes and ensure that any future U.S. rules avoid similar pitfalls. As my paper What the GDPR Really Does and How the U.S. Can Chart a Better Course describes, Europeans have long endured intrusive pop-ups and disclosures on every digital property they visit, yet they report no greater sense of trust online. As of 2017, only 32 percent of Europeans shop outside their own country, demonstrating that the European Commission’s Digital Single Market goals are still elusive. Moreover, only 20 percent of EU companies are highly digitized. These are primarily large firms. Small to medium sized companies invest little to modernize and market to other EU countries. A European company has not appeared on Mary Meeker’s list of top internet companies since 2013. If the idea was that regulation would somehow tame big Silicon Valley platforms, the reality is that the opposite is happening. The GDPR, along with similarly heavy-handed solutions like California’s Consumer Privacy Act, emboldens established platforms that have the resources to comply. Studies confirm the rank and market share of small and medium sized ad tech companies have declined by 18 to 32 percent in the EU while these measures have increased for Google, Facebook and Amazon. What’s more, the cost of compliance for regulations like these are so onerous that many firms have just stopped operating under them completely. The paper describes more than 1,000 American news media and websites that are no longer available in the EU, including The Chicago Tribune and The Los Angeles Times. If the U.S. adopted these stringent approaches, it would strengthen existing players at the detriment of startups. The EU and California rules also require that every entity collecting data must disclose in advance the exact purpose for which it will be used. This is especially problematic for many entities, particularly universities and research institutes that do not know in advance which data points may be relevant to an important scientific inquiry in the future. Such rules threaten the creative, problem-solving approach that drives academic research and entrepreneurship in the U.S. This situation is better addressed with trust-based principles rather than prescriptive regulation. All of these unintended consequences severely threaten competition and innovation in today’s digital marketplace. Yet, perhaps the most notable problem of the GDPR and California rules are their denial of individual freedom. If you don’t like the way that a company like Facebook uses your data, the answer is simple: don’t use their services. Indeed, one-third of Facebook users under 30 quit various social media platforms. But, data privacy and protection should focus on empowering people to make decisions, not empowering governments to influence which platforms people use. Good regulation should embolden people to understand the tradeoffs they are making when they use these services and encourage innovation so that platforms compete on improving how they protect data. Neither the EU nor California regulations do these things. The U.S. must take serious note of these failures and move forward with crafting comprehensive legislation that protects privacy without harming prosperity. Ultimately, this is the solution that will drive future innovation and finally provide consumers with the online protections they deserve. Julian Mclendon is a J.D. candidate at the University of Colorado and co-author of the Federalist Society paper “The GDPR: What It Really Does and How the U.S. Can Chart a Better Course”. He wrote this for InsideSources.com.